Buy the AR Parrot Drone Now! Undoubtedly the hottest robot of the year, the AR Parrot Drone is an ultra-talented quadricopter that uses four powerful propellers to cut through the air with ease while being far, far easier to control and to navigate than it�s less friendly R/C helicopter cousins. This is the flying helicopter for the layman who just wants to have a wild blast flying around your home or your block while the AR Parrot Drone beams video back to your Apple iPhone, iPod Touch, or iPad. The AR in the name stands for Augmented Reality, since you can play games where the video feed is overlaid to create fun games where you can fire virtual missiles at real or virtual reality targets (imagine firing harmless yet hilarious virtual missiles at your friends head). The amazing self-righting capabilities of the AR Parrot Drone are what makes it so much fun to fly, eliminating the months or years of practice necessary to become a decent pilot with R/C helicopters. Pure flying fun fast! The AR Parrot Drone comes with a protective ring to protect the propellers and objects around your house while enhancing downward air flow. Be advised, it can be damaged but in most instances a little super-glue and some ingenuity and you�re back in the air. If not, a complete line of replacement parts are available for the quadricopter. The AR Parrot Drone creates a Wi-Fi hotspot that you connect to with your iPhone, iPod Touch, or iPad. It uses advanced sonar sensors (ultrasound) to keep itself from going astray but be aware, excessive winds can carry it away. iPhone owners will get an additional kick out of using the iPhone�s built-in tilt sensors for easy intuitive flying control. AR.Drone, indoor hull, outdoor hull (orange/blue), battery, charger, four adapters (EU, US/JP, UK, Aus/NZ), sticker for outdoor hull (for multiplayer battles), and quick start guide. 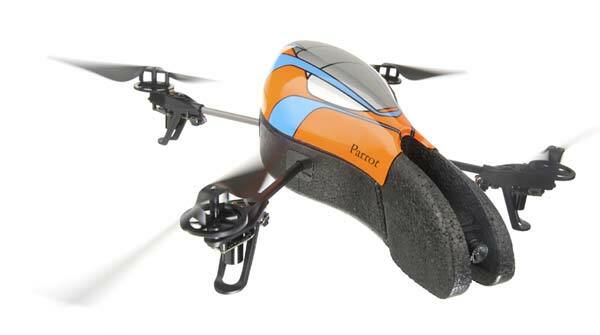 The AR Parrot Drone can be purchased at Amazon. But make sure you get your unit now before holiday quantities run out! (c) 2004-2006 RobotsRule.com and its licensors. All trademarks are the property of their respective owners.